In Tunisia, the Internet penetration has reached 67% - this is the highest rate among North African countries. There is also good average Internet speed there - 4.4 Mbps. These are excellent prerequisites for starting a business in VoIP traffic termination, especially given the high rate in this direction. However, if you decide to locate your GSM equipment in Tunisia, find out in advance how much you have to spend on connecting to a stable Internet. Popular Internet providers in Tunisia are also the cellular services providers. These are such operators as Tunisie Telecom, Ooredoo, and Orange. Providers offer Internet connection mainly on ADSL technology, but fiber optic Internet is also available. 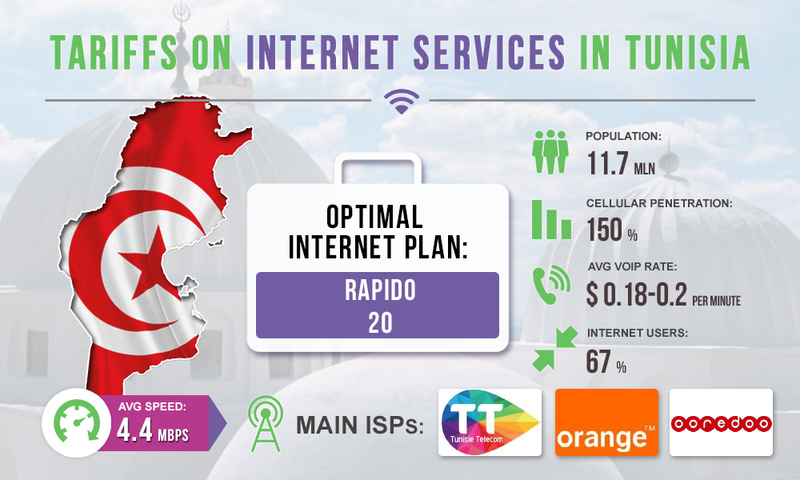 Let us discuss the tariffs for Internet services in Tunisia on the example of a popular provider Tunisie Telecom. This Internet services provider offers several ranges of tariff plans. ADSL CLASSIQUE. Connection via ADSL technology. There are several Internet plans with different speeds: 4 Mbps ($5), 8 Mbps ($6.6. ), 12 Mbps ($8.2), 20 Mbps ($9.2). WAFFI. Wireless Internet. There are several Internet plans with different speeds: 10 Mbps ($13.2), 20 Mbps ($16), 50 Mbps ($32.7), 100 Mbps ($47.5). RAPIDO. High-speed Internet + VoIP-calls. There are several Internet plans with different speeds: 20 Mbps ($14.7), 30 Mbps ($17.6. ), 50 Mbps ($29.4), 100 Mbps ($41.6). SMART ADSL. Connection using ADSL technology; in parallel, unlimited communication via landline phone is provided. Offer with a speed of 4 Mbps is available. Price per month - $9.6, plus connection fee - $ 6.6. In our opinion, the best Internet plan for the operation of voip hardware components for termination is RAPIDO 20. The speed of 20 Mbps is more than enough for gateways, and monthly expenses of $ 14.7 will not hit the terminator in the pocket hard enough.